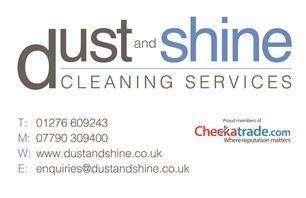 Dust and Shine Ltd - Cleaning Services based in Farnborough, Hampshire. Here at Dust and Shine our motto is: 'Small enough to care, big enough to cope.' We are a well established and highly motivated maintained company based in Hampshire.